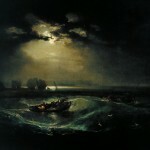 He was not the only famous artist named William Turner but his work may be the most recognizable. 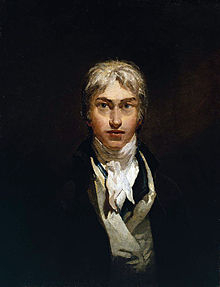 Joseph Mallord William Turner was born in London in 1775. His father was a barber and wig maker, his mother was the daughter of a butcher. We have a fairly good chronology of his career but little is known about the personal life of this life-long bachelor. Folklore tells us that the budding artist's father, seeing his son's lack of interest in academics, paid the princely sum of 200 Pounds to apprentice his son with an architectural draughtsman. He began selling his son's drawings from his barber shop when William was only 12. At 14, young Turner spent time at his Uncle's home in the country where he wandered the countryside and sketched what he saw; a practice he would continue throughout his life. By his teens, Turner was coloring prints for John Raphael Smith (1752-1812), making drawings at Dr. Thomas Monro's (1759-1833), in the Adelphi, and in the fields and streets with Thomas Girtin (1775-1802). He was also washing in backgrounds for a Mr. Porden (a name that I have not yet identified further). Young Turner was fired from the studio of architect Thomas Malton Jr. due to his inability to learn perspective. 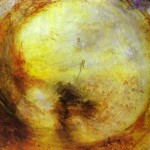 Ironically, Turner would later be appointed as Professor of Perspective to the Royal Academy. Turner began his professional painting career, like so many artists, by drawing topographical drawings for magazines. In 1789, he entered the Royal Academy. 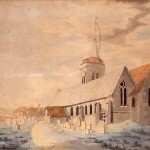 In 1791, he exhibited View of the Archbishop's Palace at Lambeth with another work and would participate in every Academy exhibition until his death 60 years later. In 1794, Turner received a commission from J. Walker, an engraver, to make drawings for Walker's “Copperplate Magazine”. This commission was the beginning of the many engraved works for which Turner would come to supply. At the beginning of the Century, Turner appeared to travel each year. While records do not tell us of his journies, each year's paintings were landscapes featuring foreign lands. around this time, he began an ambitious project of a series of one hundred etchings. Turner made sepia drawings of the subjects and then with the help of professional engravers would transfer them to copper. The project was commercially unsuccessful but believed to contain some of Turner's best work. Only 70 etchings were published with the remainder remaining in various states of completeness. Turner did not like parting with his sketches. While dining at the home of Henry Graves, Turner made a pencil drawing to illustrate a composition. Graves, pushed the papers, including the sketch, into his desk drawer. Graves wrote that Turner protested with the declaration, “I say, you are not going to run away with my drawing like that, it will be worth something one day.” Turner was known for his economy. When Graves once questioned the artist's travel expenses, the artist assumed it was a complaint. The amount in question was 15 pounds, such a paltry sum as to indicate that the artist had to have walked between destinations. The wars with Napoleon during 1803 to 1815, kept Turner home. He extensively traveled in England in search of subject matter. In 1819, he made his first trip to Italy and began the more bold use of color that his works have become known for. Turner worked in both watercolors and oils. Some suggest that techniques he learned in watercolors are what led him to incorporate light through washes of light, pastel color across the canvas. It's not really known when Turner began incorporating light into his paintings to create almost mythical landscapes where the atmosphere and the heavens mattered more than the earthly inhabitants below. Some say it was his encounter with the work of Claude Lorrain (1600-1682) in 1799 of which Seaport with the Embarkation of the Queen of Sheba supposedly moved Turner to tears. Turner's color-washed skies, often reminiscent of the colorful sunrises and sunsets seen along coastal waterways have become one of the most recognizable aspects of his work. Throughout his life, Turner lived in a number of homes. He was not known to be a social creature and some biographies mentioned that he did not communicate well with people. He lived with his father for 30 years. The two were joined by the widow Sarah Danby; identified by some as their housekeeper, others as the mother of two daughters sired by Turner. Turner was living with his mistress Sophia Caroline Booth when he died in 1851. Turner's influence can be seen in the works of John Callcott Horsley (1817-1903), William Collins (1788-1847), Thomas Creswick (1811-1869), Roberts and a number of other landscape painters including John Crome (1768-1821) who founded the art school at Norwich. This is a large book full of 500 of William Turner's works (far more than I could ever hope to share with you). The paper quality and the inclusion of so many of Turner's paintings might make the casual observer think this is a simple coffee table book. But, open the cover and you'll find a rich history of the artist and learn the significance of each of the featured works for their place in history, Turner's technique and the subject matter. As I mentioned, William Turner is most well known for the way in which he painted the natural forces such as wind, fire, and water. This book covers works currently held by a number of British museums. Due to that country's unique copyright laws, this book more than likely will introduce you to some of Turner's works that you might not have been able to see before.